While 5.11 Tactical’s capacitor-based rechargeable lights had a ground-breaking 90-second charge cycle, the PC3.300 that we reviewed had such a short runtime that practical use was limited. 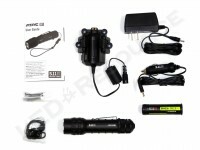 5.11 has recently expanded their flashlight product line with traditional rechargeable technology, and with 216 lumens and just over three hours of runtime, the new ATAC R1 has the performance to compete with other rechargeable lights and can also use lithium primary 123A batteries if the rechargeable battery is depleted. Weight with Batteries: 6.7 oz. 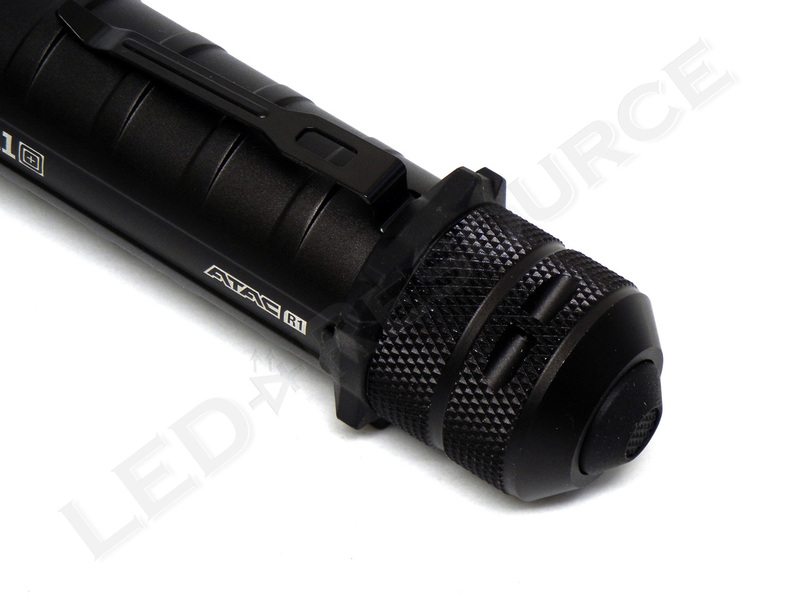 MSRP for the ATAC R1 is $140, and the light is only available in black. Included in the box are: 5.11 Tactical ATAC R1, Lithium-Ion rechargeable battery pack, 123A carrier cartridge, charging cradle, AC adapter, 12V car charger, mounting screws, break-away lanyard, and user manual. 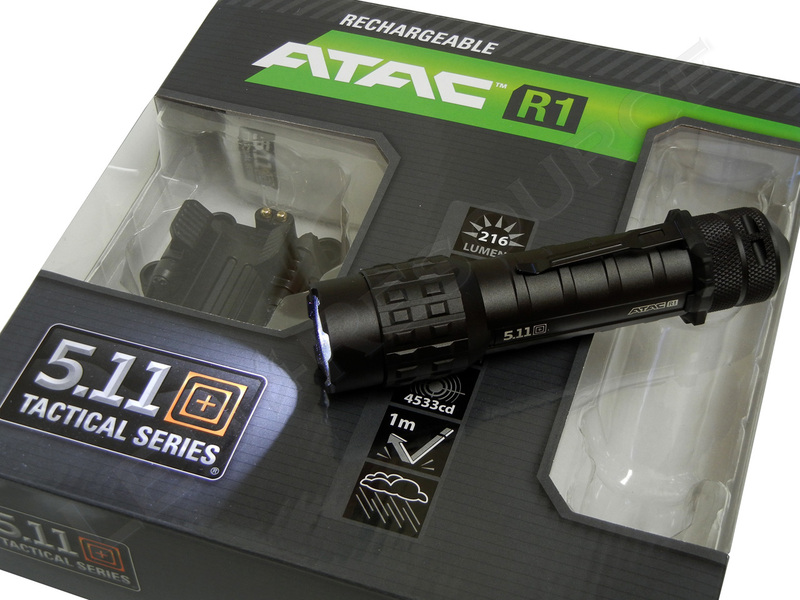 As with a growing number of rechargeable lights, the ATAC R1 also supports primary batteries when used with a battery cartridge. 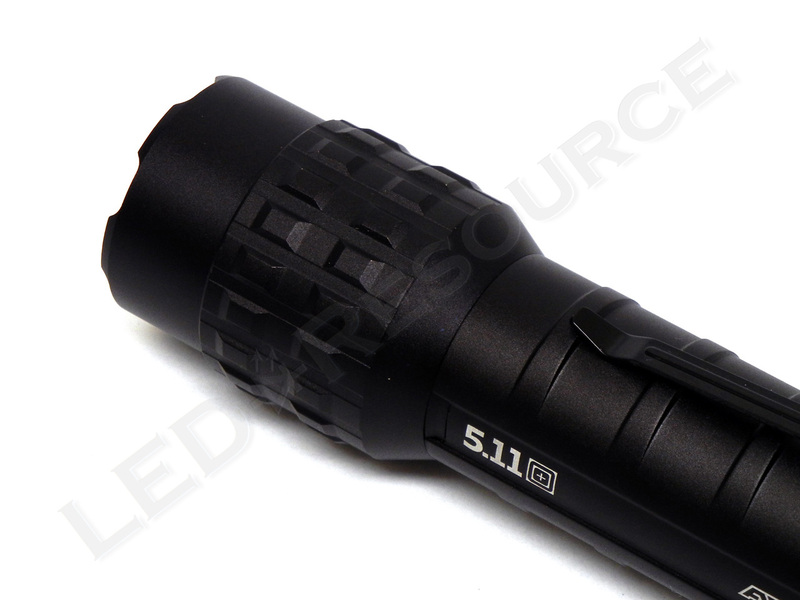 We’re still trying to get details about the lithium-ion rechargeable battery from 5.11 Tactical, so once we hear back from them, we’ll add capacity and other specifications here. 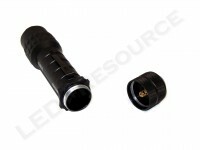 To charge the light, insert the barrel of the light into the cradle and push down until it locks. 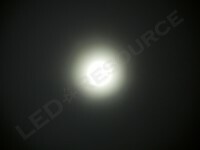 There aren’t any guides on the cradle, so adjusting the light is usually necessary to ensure proper contact. 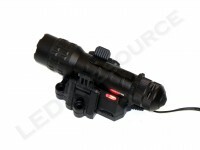 Charging indicator brightness can be adjusted using the switch on the side of the cradle. Behind the crenelated bezel is a plastic window and textured reflector. Several ridges along the body of the ATAC R1 provide grip, and both the rubber anti-roll ring and pocket clip are removable. 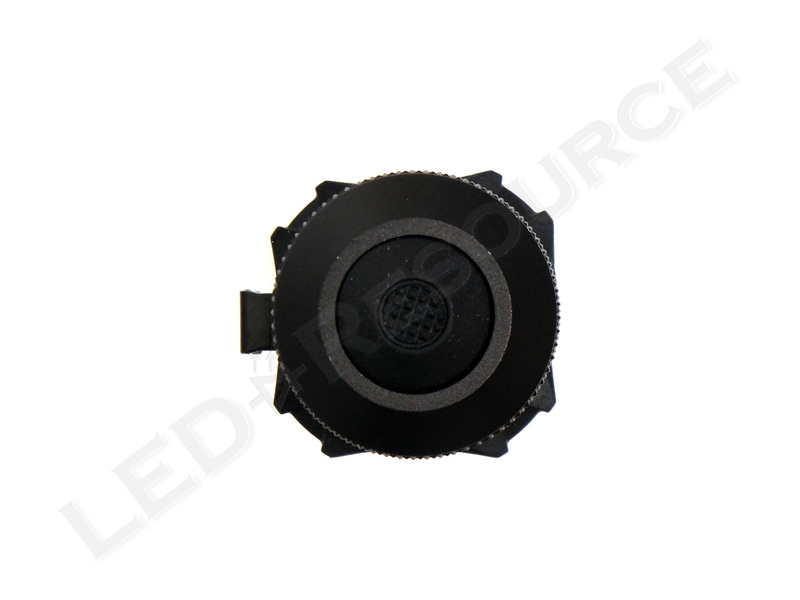 Textured black rubber covers the forward click switch, which is easy to press. User interface is identical to several other 5.11 Tactical ATAC lights, consisting of high, low, and strobe. Mode switching has to be done fairly quickly, which could be good for preventing unintentional activation, but bad for frequent use of the latter modes. 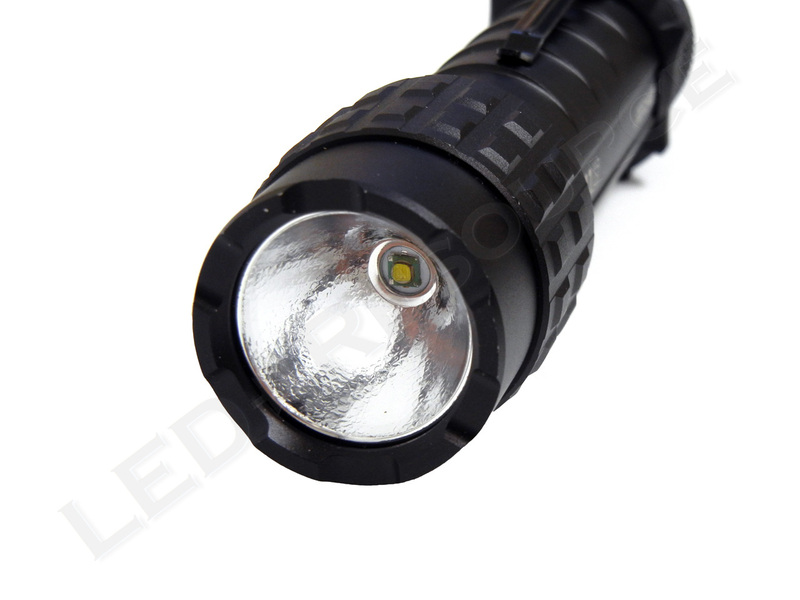 A full click (or a partial press) will run the light at the maximum output of 162 lumens. 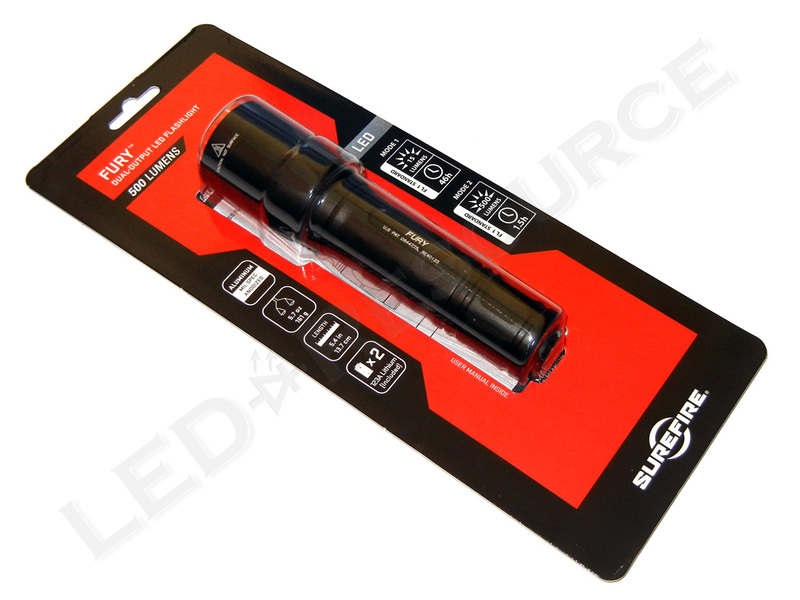 A single tap and a full click (or a partial press) will activate the low power mode at 15 lumens. Double tap and a full click (or a partial press) will activate the strobe mode at maximum output. 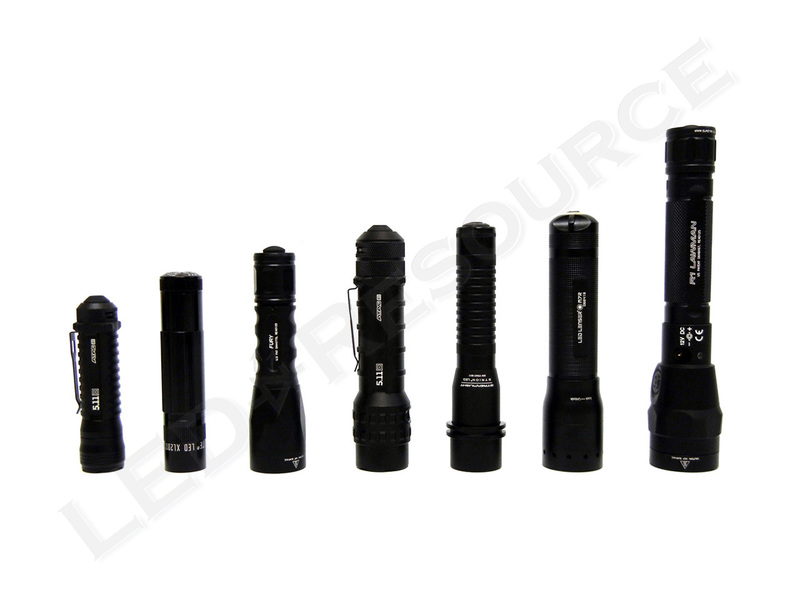 As more flashlights are entering the range of 500+ lumens, the ATAC R1’s Cree XP-G LED and modest 216 lumens aren’t especially noteworthy. 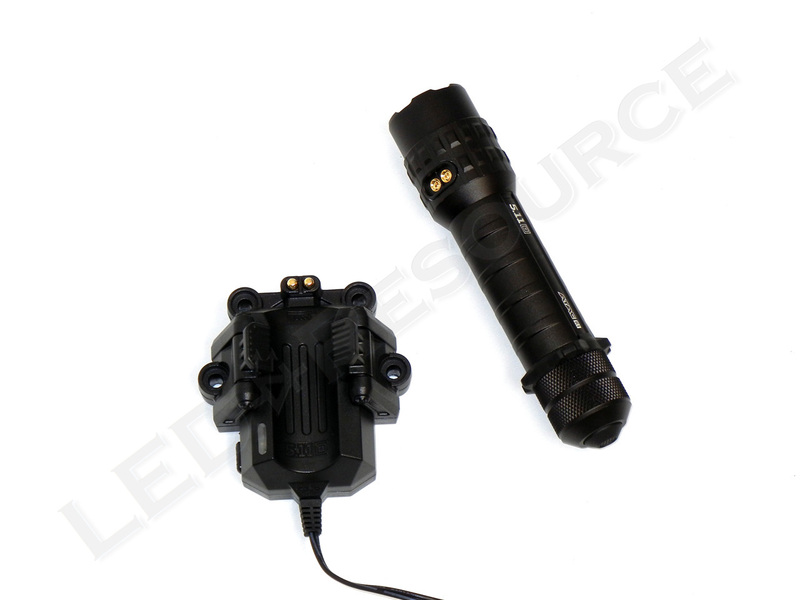 It’s still an adequate amount of light, and the increased runtime is a plus, but the ATAC R1 does leave more lumens to be desired. 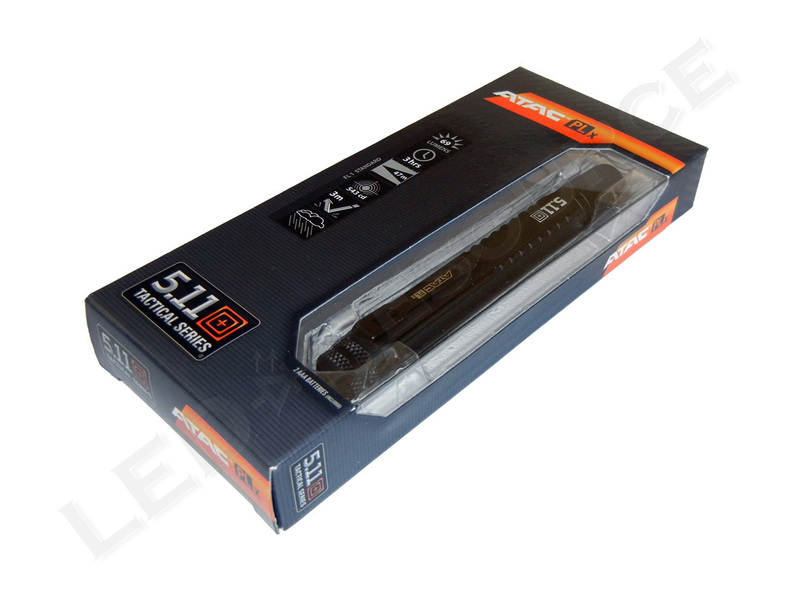 Beam profile is smooth and wide, as expected. 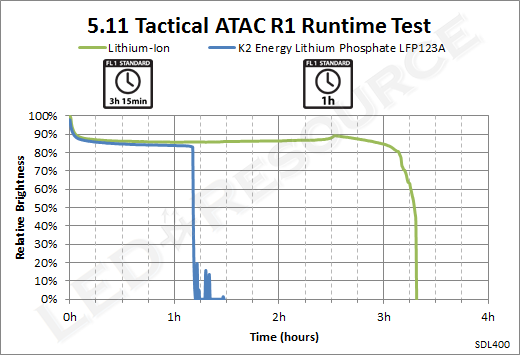 Runtime is well maintained above 80% for three hours, which suggests that 5.11 Tactical may be using Panasonic’s high-capacity NNP cells. 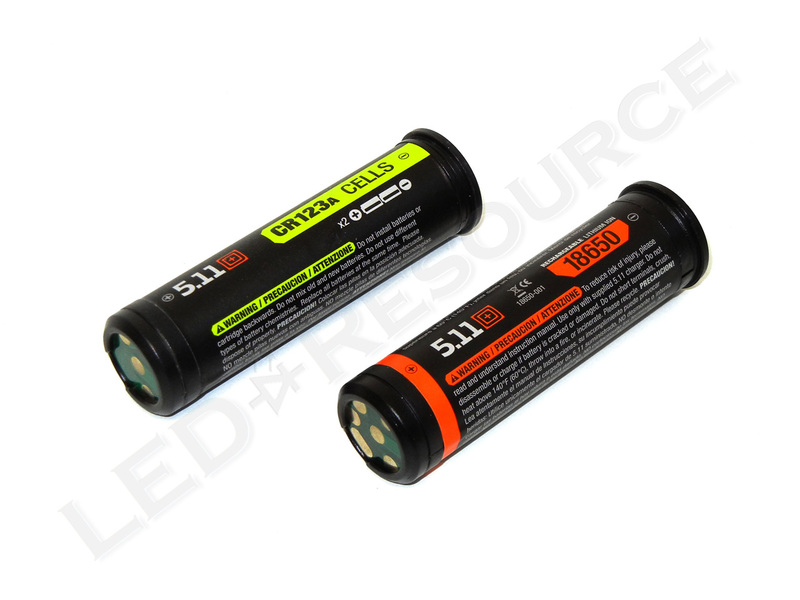 When 123A batteries are used, the ATAC R1 will flash when battery charge gets low (as seen at the end of the LFP123A runtime). Between several minor (but still bothersome) issues, such as loose fitting pocket clip and anti-roll ring, manufacturing debris on the LED, and difficulty inserting the light into the cradle in one shot, it does show that flashlights isn’t 5.11 Tactical’s specialty (that would be tactical wear). 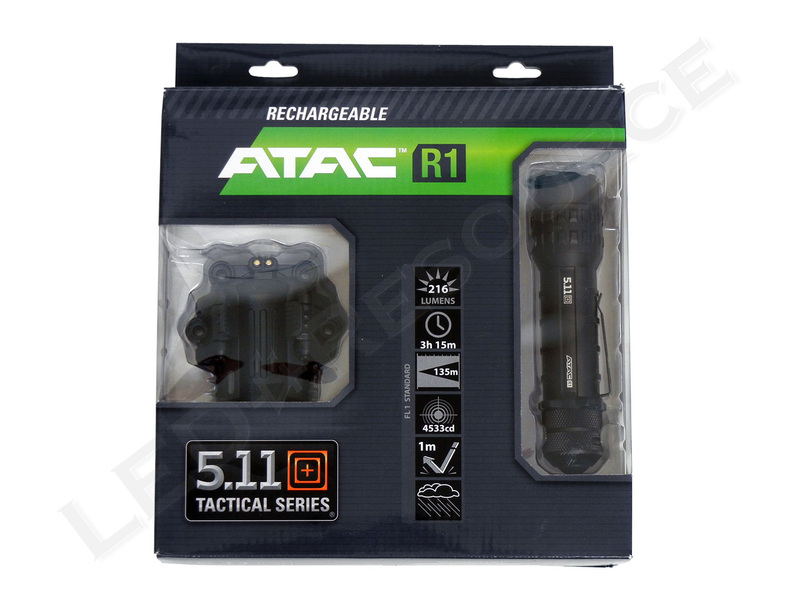 Throughout our testing period with the 5.11 Tactical ATAC R1, we really didn’t find anything that separates the ATAC R1 from the competition. It’s a decent product, and it can be a good buy if you can find one priced considerably lower than MSRP, but for $140, there are many other choices out there. 5.11 doesn’t offer the cradle as a seperate accessory, but give them a call and see what they can do. Their customer service phone number is 866-451-1726. I have had my R1 since the end of 2013 and I have loved it. I just recently started having issues with the flashlight not working on high power. It blinks once then turns off, I have tried switching the rechargeable battery to the 2X123 batteries and still the same thing happens. Has anyone else had this issue? 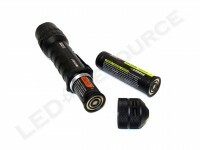 I am hoping 5.11 will help me out and repair this flashlight, I truly love it and it stinks working without it. 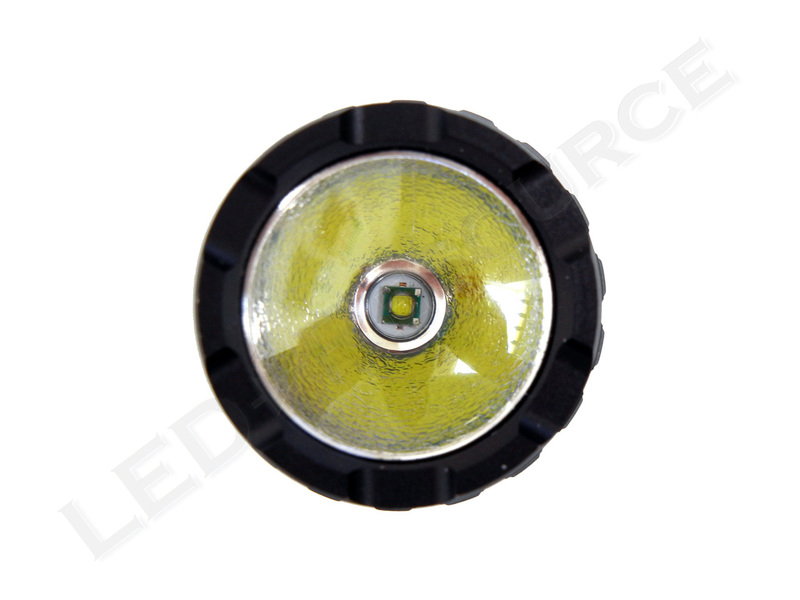 See if you can clean the contacts on the inside of the light with a cotton swab and rubbing alcohol, as well as the tailcap. If this doesn’t help, you might have to RMA the light. I just received the ATAC R3MC as a gift. When I install the regular battery pack (2 CR123A) it works like a champ. When I install the rechargeable battery the blue turns on and will not turn off (even when I change the switch to red or white light…only the blue light is on). 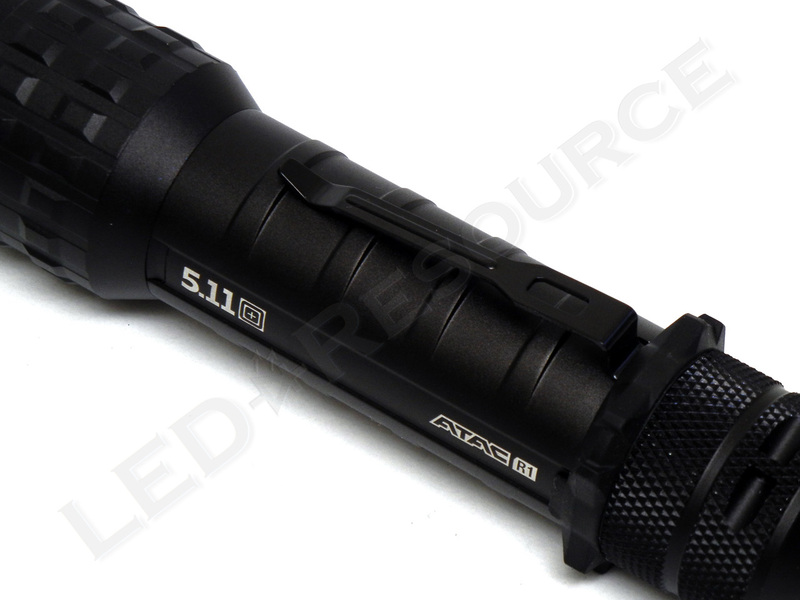 I called 5.11 for tech support and they said it happens when the battery is low, but I have now had the flashlight charging for 4 hours and the light is still on. Is it the battery or am I doing something wrong?